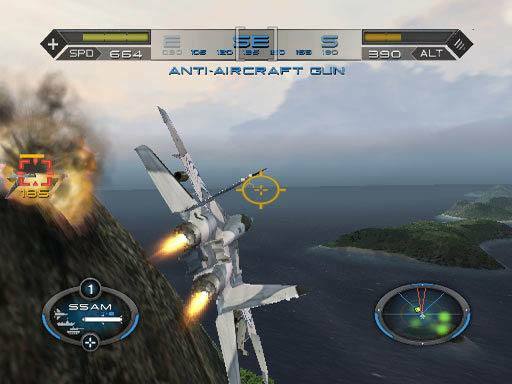 Heatseeker is one of the latest arcade jet simulators for the PSP that is oozing with 80’s and 90's glamour which borrows heavily from Top Gun in this entertaining title yet clichéd title. The story revolves around rookie Mike ‘Downtown’ Hudson who is a fighter pilot in the US government, preventing a variety of hostile attacks in the name of world peace. With over 35-missions and a plethora of in-game cutscenes, Heatseeker is like your traditional arcade jet game of the 80’s and 90’s where the player must engage in a variety of foes, whether airborne, land based or water based with unlimited firepower. Needless to say, this game is perfectly suited to the PSP, however it does become a little repetitive as you play mission after mission which is a little unfortunate. With missions across the US, down to the Caribbean, across Antarctica and into the Far East, it’ll be high-velocity combat all the way that’ll see you constantly switching from predator to prey as an enemy missiles lock on. Throughout the game’s campaigns, you’ll be proving your right to fly with the best. Are you good enough to advance ahead of your fellow pilots and stay top? Can you throw your aircraft to the floor, twist and turn, and punch out counter measures as you pull as many Gs as necessary to out-manoeuvre the missile? Basically, are you good enough to stay alive? Putting you right in the centre of the action, Heatseeker will deliver the latest fighters, current conflicts, black ops, grey and white missions and a constant stream of macho military radio traffic to build the atmosphere. 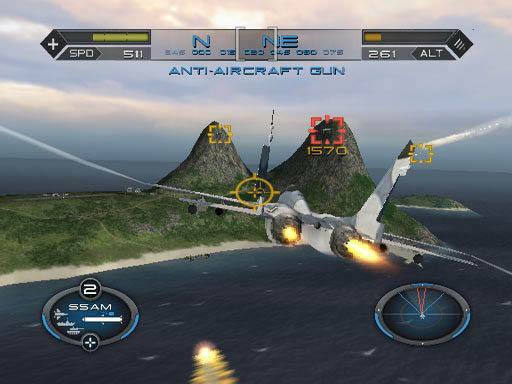 The control system of Heatseeker is perfect on the PSP with the shoulder buttons used to accelerate and break, however a double tap of each buttons will either launch your fighter into afterburner mode or violently slow your aircraft down. The D-pad is used to swap between weapons and to engage in the enemy. Fortunately, the auto-aiming aspect of the title will benefit those inexperienced gamers. As you progress through the game, various weapons and different types of aircraft are unlocked giving the player access to around 20 different types of weapons by the end of the game from stock standard machine guns to deadly rockets and even deadlier microwaves. Needless to say, the rockets are by far the most superior weapons in the title because once they are locked in, provided you are in range, you will have no problem dispensing them. Apart from your stock standard enemies such as speed boats or jet fighters, the gamer must also engage in bosses which range from easy to moderate. This of course depends on your proficiency using the PSP and gaming experience. The developers have ensured that the gaming environments are quite diverse and varied which range from Lord Roberts Island to the harshness of Antarctica. Heatseeker also offers five different multiplayer modes that include Dogfight, Team Dogfight, Fox and Hound, Base vs. Base and Last Man Flying. Graphically, Heatseeker, although looking impressive on the PSP feels a little dated with its cheesy arcade feel. 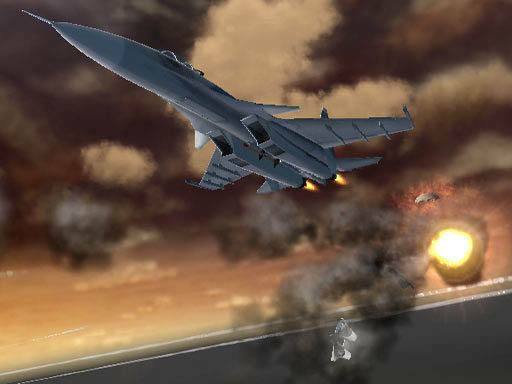 However the plane models are quite detailed and the replay of your enemies being blown to smithereens is also impressive for this handheld console. As with the graphics, the music and sound are also clichéd and unfortunately there is a lack of voice acting in this title which is disappointing. In conclusion, Heatseeker is a interesting game for the PSP with sturdy gameplay and good graphics, however the title is extremely 80's and 90's and may not hold the interest of modern gamers. Still worth a peek or two or for those that love arcade jet fighters!